Around 140 members of the Jamaah Ahmadiyah sect asked the Mataram municipal administration Wednesday for permission to leave their shelter at the Transito Guest House, where they have been living for the last three-and-a-half years. Representatives of the minority Islamic sect, branded deviant by mainstream Muslim groups, met with staff from the Mataram mayor’s office to make their request. “We asked for permission from the administration to allow us live wherever we may in the city, even along riverbanks or in slums,” Syahidin, coordinator of the refugees, said after the 30-minute meeting. 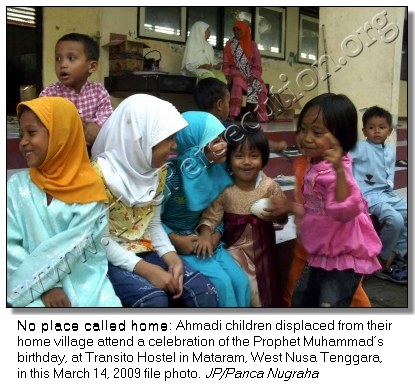 He added the Ahmadis had made the plea because local authorities had never responded to an earlier request to be allowed to return to their home hamlet of Ketapang, in Gegerung village, West Lombok. “We’ve been waiting for an answer for four months,” Syahidin said. “Neither the provincial nor municipal administrations deigned to respond to our request.” The Ahmadis were driven from their homes in February 2006 by a marauding mob of local Muslim residents. The attackers burned down their homes and mosque. They were evacuated to the Transito dormitory on Feb. 4 that year, to prevent more attacks. The government has since stopped providing financial aid and food rations for the Ahmadis, and cut off the electricity to the shelter, claiming it cannot afford the costs. “Should the government consider us guilty of whatever it is we’re being accused of, we’re ready for the legal process,” Syahidin said. “We’re ready to go to prison, even without due legal process. On March 14 this year, the Ahmadis wrote to West Nusa Tenggara Governor Zainul Majdi, seeking permission to return to Ketapang. But after a meeting with West Lombok administration officials, the refugees were told to delay their return, saying local authorities would buy up their homes and land to get them settled elsewhere. However, the West Nusa Tenggara administration later dropped the plan, citing, as ever, a lack of funds. The U-turn forced the Ahmadiyah members to stay on at the refugee camp, having been forbidden from returning home to Ketapang or to relocate elsewhere. On numerous occasions, local authorities have dissuaded them from leaving the camp by saying they would face certain persecution that the authorities had no intention of preventing. This year’s Islamic fasting month of Ramadhan, expected to start on Aug. 22, will be the fourth for the Ahmadis at the Transito dormitory. Mataram administration official Husnan Ahmad said Wednesday his office had actually allowed the refugees to return to Ketapang, on the condition they would have to assimilate into the local Muslim community. “From the very beginning, the mayor has given them permission to return home, but only if they agree to not live ‘exclusively’,” he said. He added the Ahmadis had not agreed to the terms. Ahmadiyah members and properties have come under frequent attacks from mainstream Muslims across the country, following two separate decrees from the unctuous Indonesian Ulema Council (MUI) and the Religious Affairs Ministry branding their teachings “heresy”. A central Ahmadiyah belief is that the sect’s founder, Mirza Gulam Ahmad, was a prophet after Muhammad. In July 2005, an estimated 10,000 members of the Indonesian Muslim Solidarity group attacked the Indonesian Ahmadiyah Congregation complex in Bogor, West Java.